Sam Watt, his brother and his father were all members of Clydesdale Harriers in the period immediately before the First World War. They lived at Lenzie Moss Farm outside Cumbernauld. Sam was easily the best athlete in the family and on five international cross-country vests as well as winning the SAAA Four Miles title. The club championship was held over 9 miles in January 1909 and here again he finished second to McPhee with Olympian Sam Stevenson third. This was followed by the club confined two miles flat race in which he finished second (to RP White this time) with Sam Stevenson again third. These set him up nicely for the national cross country championship in March which was won by McPhee with Watt in eighth place which was good enough to earn selection for the international. This was his first appearance in the event and with the team finishing third, he came home with a bronze medal. It might have been brighter for McPhee fell early on and finished thirty fourth with Jack three places behind him and Stevenson lost a shoe shortly after the start and had to drop out. Nevertheless it had been a good year for him. “In 1911 snow had fallen heavily for several days prior to the race but a trail of colpoured paper had been laid over a thick cover of snow. However just an hour or two before the race started, a snow storm covered the laid trail. The organisers immediately recruited a number of Welsh cross-country runners who were present as spectators, provided them with running kit, and stationed them as stewards with hand flags at strategic points around the course to guide the competitors round the trail.” Watt finished, as Shields says, ‘a disappointing fourth’ with GCL Wallach being first Scot home in third place. The team was again third. Just two days later in the Four Miles at the SAAA Track and Field Championships at Hampden on 24th June, he was third behind GCL Wallach (Greenock Glenpark Harriers) and J Duffy (Edinburgh Harriers), Wallach’s time being 20 min 41.4 sec. As a consequence, he was selected along with Wallach and Duffy to run in the Scoto-Irish International at Ball’s Bridge, Dublin on 15th July. Here he finished fourth with Wallach taking the victory. Reports at the time said that Wallach just did enough to win because he was saving himself for another race: whatever the reason, there was only bronze for Watt this time. Clearly running well, Watt did not turn out in any of the remaining important meetings that summer – not even the Rangers Sports or the Celtic Sports saw him in action. Watt’s second club championship victory was on 20th January 2012 in the race which was held at Paisley Pavilion. He won from Alex Loch and Robert Findlay – Watt and Frew would go on to represent Scotland in the international championship later that year. The club’s seven miles confined handicap was held on 10th February with an East race at Gartsherrie and a West Race at Clydebank. Watt won the Gartsherrie race from Alex Loch and Robert Frew and went in to the National Championship on 2nd March with two good wins behind him. It should be pointed out that at this time, Clydesdale Harriers had a policy of not using their best runners in the West District cross-country championships, preferring to use it to give experience to younger and up-and-coming runners so that athletes like Watt who were among the very best when they were young men, never ran in the District championships at all. The championship was held at Scotstoun and Watt led for the first lap of the two lap course. Tom Jack from Edinburgh took over in the second lap and in what was described as ‘the closest finish ever seen in a national championship’ with only four seconds covering the first three runners. Result: 1. T Jack; 2. A Kerr (Motherwell); 3. SS Watt. The other Clydesdale men to finish were Loch (4), Findlay (12), Mann (15), McPhee (20) and Frew (28) and the total of 81 points placed them second. Watt and Loch were chosen for the Scottish team to compete in the international championship at Saughton Park in April on 30th March. Bouin of France won the race and the Scottish team was second behind England: unfortunately for Clydesdale, Watt did not finish and Loch in 25th was out of the scoring six runners so that no international silver came the way of the club! 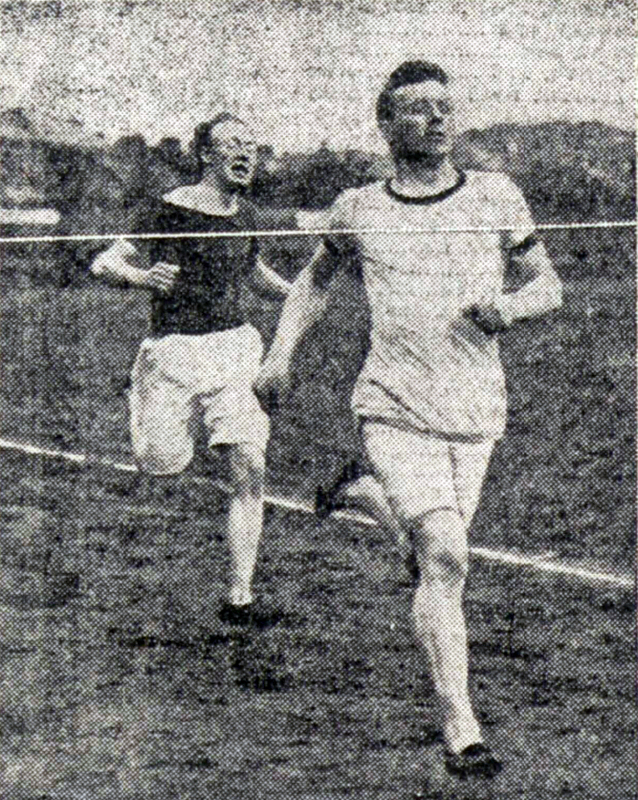 There was almost certainly some connection between that poor run and his non-appearance at Hawkhill Grounds on 7th April to defend his 10 miles track title as the ‘Glasgow Herald’ noted that he had been ill and unable to train. That fact plus the absence of Wallach who was ‘unable to travel’ undoubtedly robbed the event of some of its attraction although it was won by Tom Jack, albeit in a much slower time than the previous year. Absent for most of the first part of the season, he also missed the SAAA championships on 15th June but by August he was racing again and won the half-mile handicap at the Rangers FC Sports from a mark of 55 yards beating Thomson of Bellahouston Harriers off 69 yards, and Alex McPhee, who was now running for West of Scotland Harriers) off 60 yards. The winning time was 1:54.2 after a hectic race with all three fighting it out up the finishing straight. Interestingly enough, he missed the Three Miles despite the fact tan Hannes Kolehmainen was taking part, and the Mile which was won by Duncan McPhee. On 10th August at the Celtic FC Sports he was again out in the half-mile where he failed to qualify for the final – nor did George Dallas of Maryhill, the other on the same mark. He was entered for the two miles invitation race on the following Tuesday but however well he ran, he wasn’t in the first four in that race. He went into winter 1912/13 in good form. Watt was absent from the annual seven miles handicap and team race on 9th November (the course went round Scotstounhill, Knightswood, Anniesland, Crow Road and Jordanhill) but on 23rd November 1912 he won the club’s 5 miles open handicap at Anniesland from a youngster called Duncan McPhee. McPhee was the younger brother of Watt’s old rival Alex and would go on to become club captain before leaving the club for some reason and joining up with West of Scotland. McPhee was fourth in the club championships and team race held on 18th January at Maryhill where Watt was again victorious with Findlay second and JC Thomson. Watt, McPhee and Peter McGregor were drawn in the same team which finished second. In the seven miles confined handicap held on 15th February, Watt had the fastest time in a race won by William Henderson, which set him up for the national championships on 1st March at Scotstoun. Archie Craig of Bellahouston Harriers won by 40 yards from A McDonald, Monkland Harriers, with Watt only two seconds away in third. Juvisy Aerodrome in Paris was the venue for the race in 1913 and Watt finished seventeenth for the Scottish team. Again absent for the first half of the season and missing both the Ten Miles in April and Four Miles in June he made a winning appearance at the Rangers Sports on 2nd August when he won the Open Handicap mile off 40 yards in 4:35.4. Nor was he prominent in the winter 1913/14 season but he led the club team home in the national and did well enough personally to qualify for the international team. This was held at Chesham in Buckinghamshire and Watt in twentieth place was last scoring runner for the Scotland team which finished second. Watt’s career, like that of so many others, ended with the 1914/18 War . It had been a good one with gold, silver and bronze individual and team medals at club, Scottish and international levels and with international vests won on the track and over the country.